I wonder if the Isley Brothers found the inspiration for their classic 70s hit “Summer breeze, makes me feel fine, blowing through the jasmine in my mind” after a visit to the eastern Costa del Sol on a warm, summer Mediterranean evening? 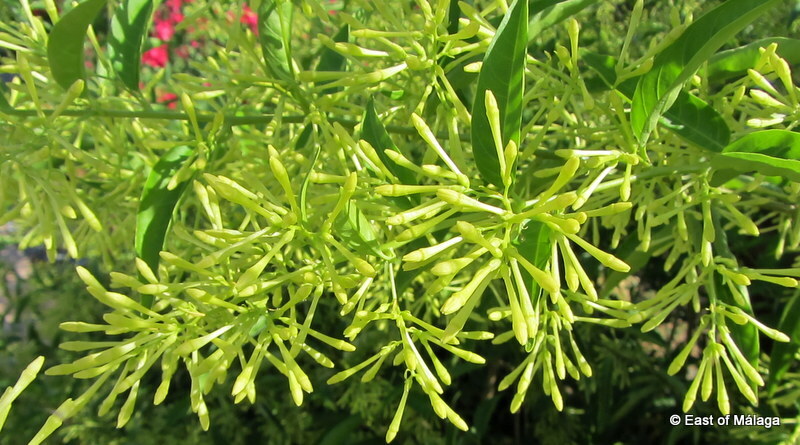 If they did, then the heady fragrance of the flowers of the Dama de Noche (otherwise known as the night-scented jasmine, lady of the night or, to use the Latin name – cestrum nocturnum) was surely the catalyst. 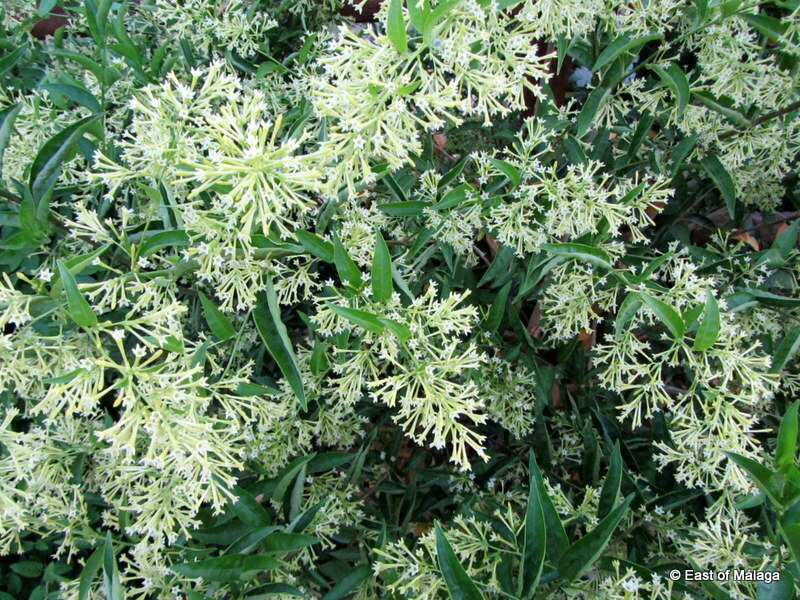 By day, the Dama de Noche masquerades as an upright, fairly ordinary looking shrub with dark green leaves and large clusters of small, lime green buds, with no perfume. As dusk falls, however, the buds open into white, star-shaped tubular flowers and their bewitching, intense scent is wafted around on the breeze and can often be detected for hundreds of metres around. Every evening at this time of year, I throw all the windows open in the house to allow the perfume to waft inside. Such a wonderful summer memory! This entry was tagged Andalucía, flowers, gardening, Malaga, perfume, photography, plants, Spain, summer. Bookmark the permalink. Oh its gorgeous and not a jasmine I’ve ever seen, I love the fragrance and even my perfume is Jasmin Noir by Bulgari. I love the perfume as it wafts around the garden and into the house. They’re lovely 🙂 We have a variety in our UK garden too. I love the heady scent of jasmine! It looks different to the jasmines I grow in my garden in the UK, but their scent is delicious too! Yes, you’re right, Sue – the jasmine we used to grow in the UK has such a lovely, delicate perfume. 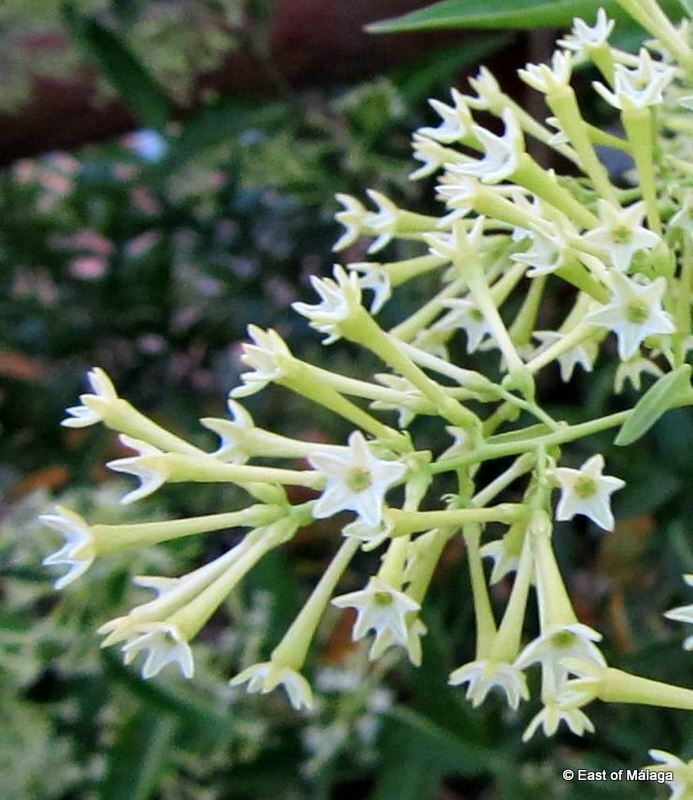 The Dama de Noche here is quite different, and some people can’t bear them because their scent is so powerful. Pingback: East of Málaga: Shall I compare thee to a Summer’s Day in England? | East of Málaga .... and more! I have several night jasmines growing in my backyard. A Persian client of mine, who had a fabulous garden/nursery gave me a couple of them years ago and they grow just fine. And the bouquet…well, you know. That song Summer Breeze was first written by a very soft rock duo called Seals and Crofts. I don’t worry too much about Seals and Croft. They had quite a big hit with it too. The whole royalty, intellectual rights business has gone too far somehow, what with patents on seeds and genomes. Hmmm … yes, we discussed that in these comments back in July 2012! I can smell them! Beautiful!